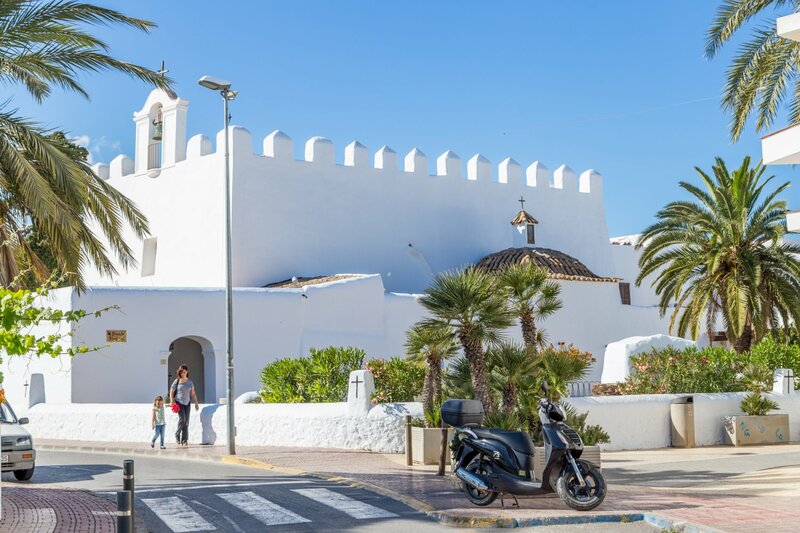 A traditional Ibizan village with a fine old church and pretty central square right next to Playa d’en Bossa, boasting a good choice of bars and restaurants. This traditional Ibizan village is located in the island's south, close to the airport and the resort of Playa d'en Bossa with only a short drive away from Ibiza Town. It is well worth a visit, even if just for a few hours. It is one of the only places that almost exclusively uses its Catalan name rather than the Castilian Spanish “San Jorge”. The main centre of Sant Jordi is located around its impressive fortified church, the best preserved on the island. It is believed to originally date back to the 14th century and was created to serve the spiritual needs of those that worked the nearby salt flats of Las Salinas. The thick walls and battlements hark from the day when the locals would hide their valuables there to protect from the constant attacks of pirates. There is a charming tree-lined square next to the church and in the roads nearby you will find good restaurants, small bistros and traditional bars. Es Tancó has a fantastic selection of pizzas, which many consider to be the best on the island, to be eaten on the charming little terrace or for takeaway - there is also a delivery service. Rasca Lobos offers you traditional fare and modern dishes using local ingredients as well as a great range of tapas. Opposite this place is Vinyl, which locals travel from across the island to enjoy, attracted by its cool atmosphere, amazing homemade burgers and cool cocktails. There are several large supermarkets in Sant Jordi, so if you are staying in Playa d'en Bossa, you can get your groceries there for a little less money than in the resort itself. Close by is the shopping area of Can Bellotera on the Ibiza Town to San José road, also popular with people renting villas around the village. Here you will find a French bakery, fishmonger, wine shop and a health store selling locally produced fruit and vegetables and eggs sourced from the villagers. The bar Can Bellotera and the opposite restaurant of the same owners and name are very popular. If you continue driving to San José, a little further up you will come to the restaurant Cas Costas, source of some of the best quality grilled meats on the island. Cas Costas also has a great organic supermarket, selling food and drink till late, even on Sundays. Sant Jordi's Hippodrome, originally built for racing horses, is now best known for the weekly flea market that fills the space each Saturday the whole year round. All kinds of curiosities are set out on the stalls on this vast sandy stretch of land. You can find second hand books, ornaments, clothing, jewellery from India, and even local food products. Take a stroll around and see if you can pick yourself up a good bargain and practice your haggling skills. There's a reasonably-priced cafe/bar here too if you need a pit stop. At the end of the market bongo drummers meet and create a fantastic atmosphere with their drumming echoing around the walls of the hippodrome. Every year the village celebrates the Festival of Sant Jordi, which welcomes in spring with activities and a small funfair that start in April and run well into May. The biggest day is its patron saint's day on 23 April, St George's Day, when you will see a procession of sacred statues as well as stalls selling local food products and crafts. When night descends there's live music in the square for all to join in. This is the day when women traditionally receive a red rose, as a reminder of when St George slayed the dragon. The story goes that roses would grow wherever drops of its blood fell. A few weeks before you'll find the full programme in our events calendar. Sant Jordi is one of those places that surprises you with all it has to offer, so make a date with this traditional Ibizan village.